Our M18™ REDLITHIUM™ HIGH OUTPUT™ XC8.0 Battery Pack provides you with 50% more power and runs 50% cooler vs our other M18™ REDLITHIUM™ XC battery packs. 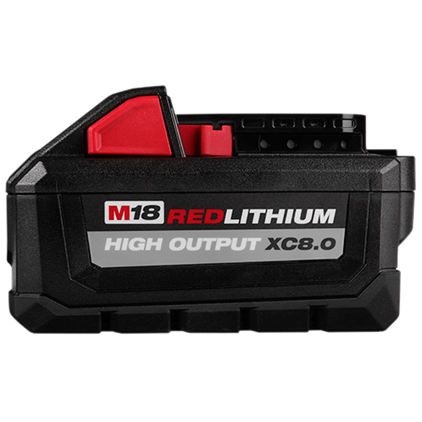 The optimized combination of smaller size and increased power of the 18-volt battery provides you with a great solution for the entire range of M18™ products. The lithium-ion battery delivers fade-free power and runs substantially cooler through heavy applications, allowing you to push your cordless power tools throughout a wide application range. The M18™ XC8.0 battery provides you with increased power in extreme-cold weather conditions (below 0F / -18C) and delivers more work per charge, driving corded replacement. The REDLITHIUM™ HIGH OUTPUT™ XC8.0 extended capacity battery is fully compatible with all 175+ Milwaukee® M18™ solutions.